In 2011 the flu season was mild but U.S. health officials say it's unclear what this year will bring and are urging people to get vaccinated. The flu shot isn't for everyone, but is important for people who are six months and older, pregnant women and those with high-risk conditions. NBC's Dr. Nancy Snyderman reports. Just about everyone is supposed to get a flu shot every year, and two groups are particular no-brainers -- pregnant women and health care workers. But new numbers released on Thursday show that fewer than half of pregnant women got vaccinated last year and just two-thirds of health care workers did. Although they’ve been pushing flu vaccination hard for more than a decade, public health officials admit they are still finding it a hard sell. But it’s not necessarily resistance. It just may not yet be easy enough to get the vaccine. And recent mild flu seasons haven’t helped. About 128 million people, or about 42 percent of the U.S. population, got immunized against influenza last year. Because flu viruses constantly mutate and evolve, people must get vaccinated with a fresh formula every year to be fully protected. This year’s vaccine protects against the three most common circulating strains. The best vaccination rates are among babies aged up to 2, with nearly 75 percent vaccinated. That’s because babies make regular visits to pediatricians, and vaccinations are a routine part of those visits. And more than 63 percent of 2- to 4-year-olds were vaccinated last year. But just 29 percent of 18- to 49-year-olds had a flu shot. Pregnant women are especially vulnerable to flu. Not only do they get sicker, because pregnancy suppresses the immune system, but the infection can lead to losing their babies. The vaccine also protects a woman’s newborn, who cannot get the vaccine until age six months. “Influenza is five times more likely to cause severe illness in pregnant women than women who are not pregnant,” said Dr. Laura Riley of Massachusetts General Hospital in Boston and the American College of Obstetrics and Gynecology. But a CDC survey released Thursday showed that just 47 percent of pregnant women had a flu vaccine last year. If their doctors both recommended and provided the vaccine, nearly 74 percent of pregnant women got the shot. Just 11 percent of women whose doctor said nothing got immunized. Even though doctors have been stressing for years that flu vaccines cannot give people the flu, a full quarter of the pregnant women who refused the vaccine said they believed it would infect them. Another 13 percent thought their babies were at risk. “Pregnant women worry about everything,” Riley said. “We spend a lot of time in this country talking about you can’t eat this, you can’t eat that. It takes us a little while to get the message out about how efficacious (the vaccine) is. We are preventing a very severe disease potentially and we are protecting your baby.” Vaccination does not raise the risk of miscarriages or birth defects. A mild flu season last year and memories of the H1N1 pandemic that didn't turn out to be as serious as expected have made flu shots a hard sell to the general public. Flu may be off many people’s radar because the last two years haven’t been especially bad, and because the 2009 H1N1 swine flu pandemic didn’t turn out to be as bad an initially feared. Yet, 1,300 children died from H1N1 that year and about 100 U.S. children die every year from flu, half of them previously perfectly healthy, CDC says. The CDC estimates that anywhere between 3,000 to 49,000 people a year die from flu in the United States. A lot depends on the strains circulating. “Flu is unpredictable. Just because we got off easy last season does not mean we will get off easy this season,” Riley said. The other group that should have 100 percent vaccination is health care workers. The CDC data show that more than 86 percent of physicians are vaccinated, followed by more than three-quarters of nurses. But the numbers plummet to just half of workers in long-term care facilities, where patients are especially vulnerable to flu. As with the pregnant women, health workers were more likely to get vaccinated if it was easy for them. More than 78 percent of health care workers got immunized if free vaccine was made available for several days at work. And 21 percent of the health workers said getting flu vaccine was now a condition of employment. More employers should consider making it a requirement, said Litjen Tan of the American Medical Association. This year, 135 million doses of flu vaccine will be available to the U.S. market. People can get vaccinated at pharmacies, at big-box stores, grocery stores, doctor’s offices and often at their places of employment. Most private insurance companies and Medicare pay for the whole cost of the vaccine. And while the vaccines are not specifically formulated to protect against some new flu strains that a few people have caught from pigs, they may offer some help, health officials said. So far, the three new variants identified this year -- H3n2v (the little v stands for “variant”), H1N1v and H1N2v -- don’t spread easily from person to person. Almost everyone infected has been close to pigs. One person has died from the new H3N2v virus, but everyone else has recovered. 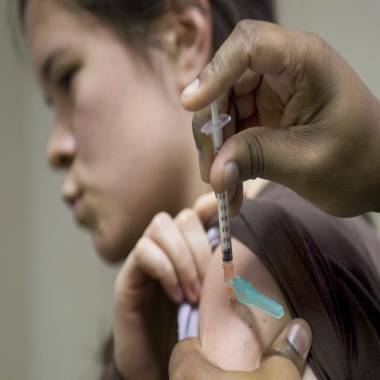 The CDC’s Dr. Daniel Jernigan says people alive in the 1990s have some immunity to the H3N2 version, and the new H1N1v is close to the strain that the current vaccine targets, although the protection is not perfect.